My grandmother, Pearl Doris Reed, was born in Lebanon, Kentucky in 1886. She was the youngest of the eight children of Anna Allen Reed. The older children had a different father, Palmer Reed. The four youngest, including Pearl, were the children of Buford Averitt, a white physician. By 1888 Pearl’s oldest brother, George, had moved to Indianapolis Indiana to work at Van Camps cannery. The rest of the family soon followed. She attended school, graduating from high school and took piano lessons. Albert and Pearl met at church. 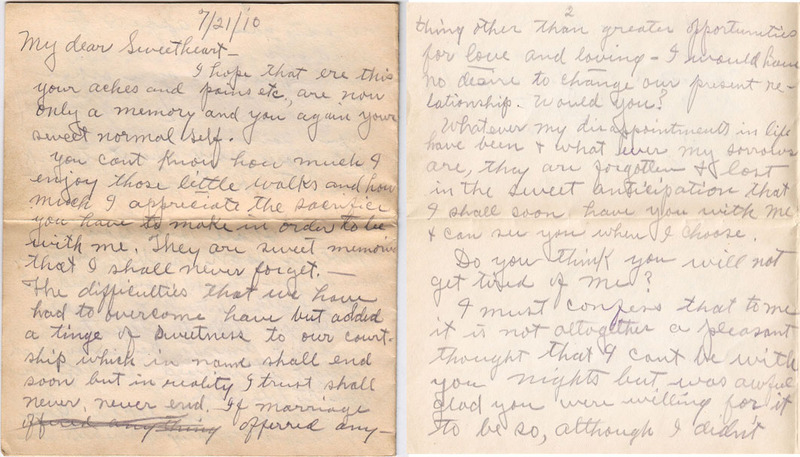 They both signed the petition to organize a United Presbyterian Church on April 30, 1907. Pearl sang in the church choir and also at community and church events. By the time I heard her sing she had a frail, old voice. I wish I could have heard her back in her prime. In 1907 Pearl was 21. Three years later, when this letter was written, she was 24. 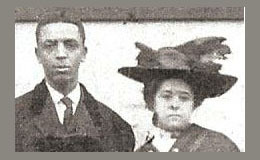 On September 21 he and Pearl Doris Reed were married at her home. 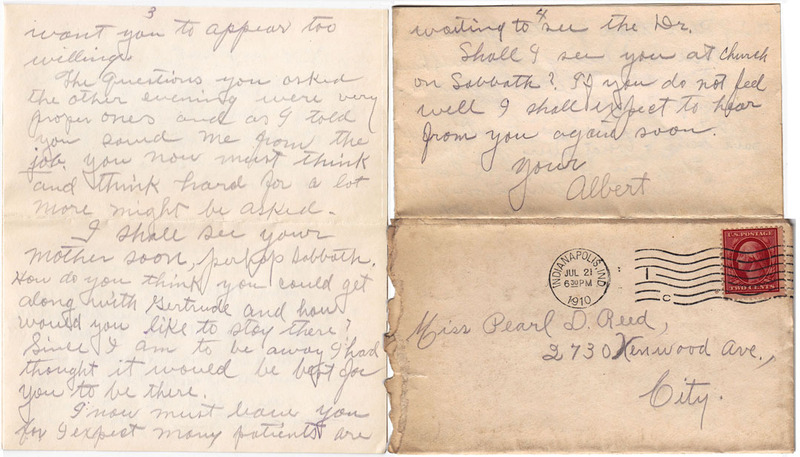 In 1911 Pearl’s mother died and the first of their 7 children was born – Albert B. Cleage Jr, my father. In 1912 the family moved to Kalamazoo, Michigan where my grandfather set up in private practice. And that takes us to the end of the time covered in these letters. The difficulties that we have had to overcome have but added a tinge of sweetness to our courtship which in name shall end soon but in reality I trust shall never, never end. If marriage offered anything other than greater opportunities for love and loving – I would have no desire to change our present relationship. Would you? Whatever my disappointment in life have been and what ever my sorrows are, they are forgotten and lost in the sweet anticipation that I shall soon have you with me and can see you when I choose. Do you think you will not get tired of me? I must confess that to me it is not altogether a pleasant thought that I can’t be with you nights but was awful glad you were willing for it to be so, although I didn’t want you to appear too willing. The questions you asked the other evening were very proper ones and as I told you saved me from the job. You now must think and think hard for a lot more might be asked. I shall see your mother soon, perhaps Sabbath. How do you think you could get along with Gertrude and how would you like to stay there? Since I am to be away I had thought it would be best for you to be there. I now must leave you for I expect many patients are waiting to see the Dr. Shall I see you at church on Sabbath? If you do not feel well I shall expect to hear from you again soon. wow, how wonderful to have a letter that is such an echo of the lives that came before you. There is a lot of love in his words. Beautiful. How sweet this letter is! Beautifully written. You have so many wonderful keepsakes Kristin! Lovely. So much between the lines! Such a gentlemanly letter. It’s rather exciting to see early love expressed in writing like that. beautiful letter. Your letters made me think that we are missing something with our emails and texts? At least, many people don’t write or receive love letters that sweet anymore.